Brunch is Big in NYC. Everyone loves brunch. I've had some great brunches recently, one being at the little Lower East Side joint Zoe, on Eldridge Street. I had heard good things about this gem of a joint, a "New York American Restaurant" helmed by chef Zoe Feigenbaum. There are touches from around the globe being displayed in her cooking though. The Middle East come to the table in the freshly baked delicious pita bread. 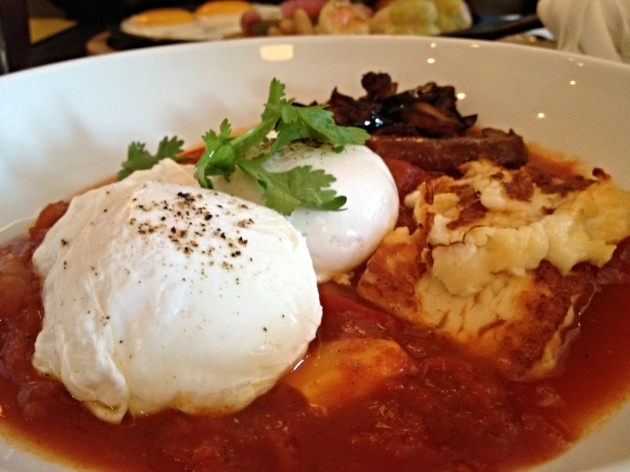 And my Moroccan poached eggs ($15) with shakshouka, halumi cheese, eggplant, and merguez sausage was fabulous. Perfection. Zoe give a taste of Mexico with her Mexican shrimp and eggs ($15) with white beans, avocado, and salsa verde on a homemade tortilla. Olé! Another NYC weekend, another magical brunch.